Hands On Ladders Class- Boise Firefighters Symposium hosted by Fire Nuggets. We are proud to announce our participation in the Boise Firefighters Symposium on June 2nd, 3rd and 4th. We will be rolling out our brand new Practical Ladder Work class. Which is a hands on ground ladders class. We will have a classroom session in the morning that prepares you for quick accurate size ups for choosing the right size ladders. We also cover how to prioritize which ladders go where on multiple different types of buildings and fire scenarios. The hands on portion will be focused on all sizes of ground ladders. How to get the maximum efficiency of 1 and 2 firefighter throws along with ladder packages, carries with tools, overcoming common fire ground obstacles, untraditional ladder throws, etc. This is a great conference lineup and we are humbled to work alongside some very well known and respected fire service instructors. Jeff Shupe, Daryl Liggins and Rick Payne will be teaching their Engine Co Operations Class and Brothers In Battle, LLC will be putting on their full day forcible entry class. 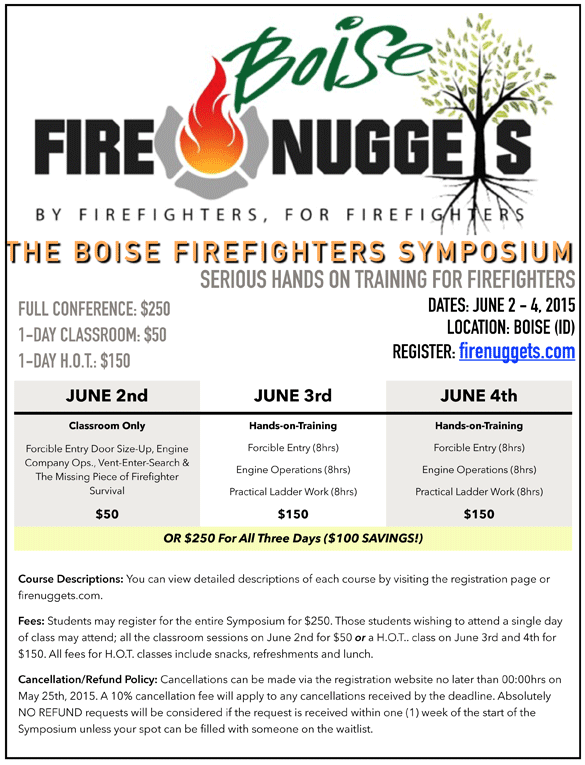 Visit http://www.cvent.com/events/boise-firefighters-symposium/event-summary-8a2157c69cdf401994df989f90f1eae6.aspx to register and for more information on this conference. This entry was posted on 02/02/2015 at 8:23 pm and is filed under Uncategorized. You can subscribe via RSS 2.0 feed to this post's comments. You can comment below, or link to this permanent URL from your own site.